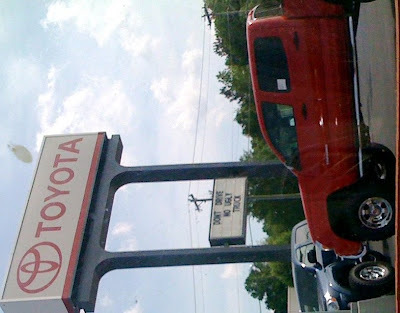 First ... this is a sign at a Toyota dealership in Greenville SC ... 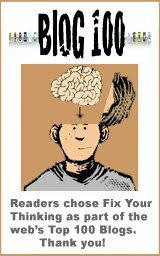 I really think it's quite stupid .... it seems as if they are referring to their own trucks! I have a hard time finding any truck "good looking" - but at the moment it seems to be a status symbol for the embarrassingly idiotic who think they are parading around in a gas guzzler. Hummer and truck sales are actually up with higher gas prices as people seem to think it shows they have money. It's irony that a lot of people are stuck with driving a truck because they thought it was cool to drive one back when gas was low. Next we have a picture of the stone walkway that leads to my girlfriend's house ... I wrote this on there and fixed her dinner on Cinco De Mayo (May The 5th) on Monday. In case you don't get it ... "Stevie Nick's Tex Mex Round Up" is one of my favorite Saturday Night Live skits with Lucy Lawless (aka Xena: Warrior Princess) as Stevie Nicks. 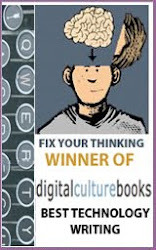 You can watch it here <--- requires RealPlayer. 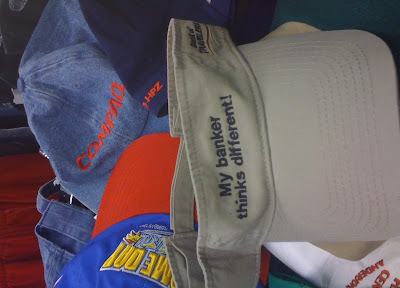 I found this visor hat at the jockey lot and thought it was interesting because it blatantly copies the Apple "Think Different" campaign. Last ... 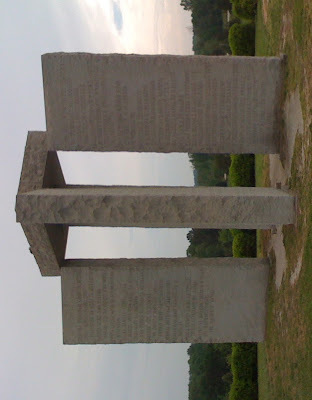 I have a picture of what is called "The Georgia Guidestones". It's also called "The American Stonehenge". It is located in Elberton, Georgia USA - just over the Georgia / South Carolina border and about 45 miles away from my hometown in Greenville, South Carolina. I'm going to be doing an interesting news story on this "monument" soon. I'm going to try to be the first ever to get the real story behind the monument as their seems to be a lot of mystery surrounding it and who put it up.